From folks just like YOU! “We want to thank Mandi and About Australia for providing us with an outstanding vacation. Your help was invaluable. We couldn’t have had better service than you provided. The accommodations you got us in Sydney and Melbourne very nice. The locations were excellent. We could walk to most everything and rooms were the best. The 14 day tour of New Zealand was everything we hoped for. 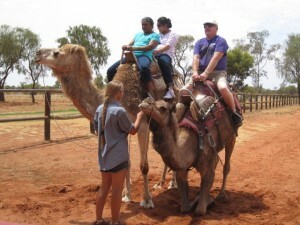 We would not hesitate calling on you for any trip About Australia has to offer. Thank you for your help setting up a great month for us. Even the weather was perfect.” – Pete and Diane D.
My fiancé and I booked our Australia trip almost a year ago with the help of our About Australia specialist. She helped us put together an awesome custom itinerary within our budget and she was so knowledgeable and helpful in the whole planning process. We were so excited after working with her and couldn’t wait for our trip. Flash forward 10 months and we have just returned from the most amazing vacation of our lives! Everything was scheduled perfectly; we didn’t have to worry about any flights, hotels, transfers or excursions when we arrived. All of the vendors and partners were extremely friendly, knowledgeable, fun and very timely! We couldn’t have planned a trip like this on our own without a lot of headaches and time. I am so glad we worked with About Australia! We hope to go back someday and when we do, we will definitely book through AA again! Thanks so much! I was initially worried scheduling a huge trip like this online but I can honestly say, we were duly impressed with the entire trip. The price for everything that was included was phenomenal, there is no way I could have planned all of that myself for the same price. It took a lot of the stress of going on the trip off of me by allowing someone who knows what they are doing do all the legwork. We never had an issue with any of the bookings or scheduled activities; everything was on time (shuttles, flights) and almost everyone that we interacted with was helpful, kind, and fun! Seriously, most of the shuttle drivers were simply fantastic; they were informative and pointed out interesting facts as we drove along and answered any questions we had as well. The amount of activities that were scheduled was just right, it gave us plenty to do, but also plenty of down time to explore on our own. We do want to thank you for all the arrangements you made for us. It was pleasant working with you to fit in all that we were able to do on this huge continent. It was great not to have to worry, work and plan while we were taking in all the sights and sounds of being in Australia. This was a trip we had hoped for and dreamed about for 40 years.We saw everything we had hoped to see. Thanks to the flexibility your plan gave us we also enjoyed a great week with our farm friends where we saw the Grampiens and the Arapolies. 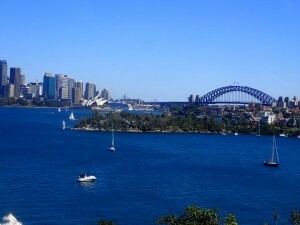 One of our most enjoyable times was our arrival in Sydney and our days spent there –the opera house ,of course, the Taronga Zoo and our walks to other places in the city. There’s a lot we could mention. We especially wanted to be sure you were aware of “vivid” Sydney and the great light show on the harbor in the evenings of that particular week in June. That was amazing! We hope others who come to Sydney during that week can enjoy it also. Amazing would be our customer rating for satisfaction. Everything was wonderful. Enjoyed it all….After we did the harbor cruise in Sydney, the captain drove us over to the Opera House and put us out for our tour there. Just some examples of how nicely we were treated. The tours were fun and the driver always found a place for Pop to stay if he could not walk the distance with us. The scenery was spectacular and had a fun drive with the kinfolks on the ocean road. Troy never stopped grinning the whole time we were there. 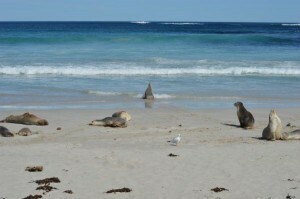 They were happy to see us – not much company from home. The field of light was awesome as was Uluru…. Such a memorable trip. Thank you so much for making the arrangements for us. Would recommend you anytime. Might be good to warn people walking into the field of light that is in deep sand, hard to walk, and too long if you have difficulty walking. Should have a short cut for old folks to get out and not go the whole way. Oh, and the hotels were fine; right in the middle of the action. If Pop was able, we could have walked most anywhere we went in Melbourne and Sydney and the resort in Uluru. Thanks again. My trip to Australia and New Zealand was the best trip I have been on to date! Going to a new place seemed daunting at first, but the help I got from the About Australia team made everything easy. I didn’t have to worry about a thing! Travel and accommodations would have been a huge hassle if I tried to do this on my own. I don’t think I could get past the driving on the left side of the road. Our family of 5, took an 18 day trip over the 2015 holidays to Australia and it was unbelievable. 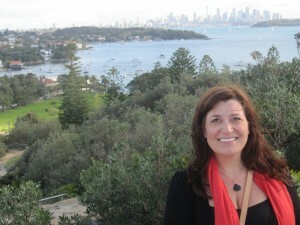 We gave Joanne, our About Australia travel agent, a compliment every day of vacation. Our hotels were stellar, especially our Christmas hotel at Peppers Soul in the Gold Coast .The excursions were wonderful and every reservation was without any question or confusion. 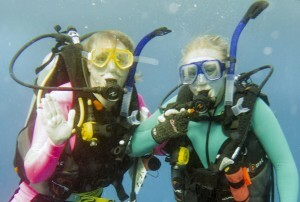 We loved the Great Barrier Reef on Quicksilver in Port Douglas. Hamilton Island and Whitehaven Beach is a MUST-SEE! The eastern coast towns from Port Douglas to Sydney were all so unique, especially Byron Bay. The people were amazing and super friendly ! Australia Zoo was a very special place thinking about Steve Irwin and all he has done for the animals of Australia. Watching New Years Eve from the Sydney Metropolitan Roof Top was a New Years we will never forget! There were so many great highlights it is hard to pick just a couple.We would highly recommend Joanne and About Australia if you are planning a trip to the “Down-Under” soon! It was a trip of a lifetime! We had such a wonderful time! I didnt want to come home. You helped us gain memories for a lifetime. You also helped me accomplish some life goals/dreams. My trip was fantastic! The hotels were wonderful and the side trips you arranged were perfect. We had a great trip! Our stay in Melbourne was wonderful. The tour along the Great Ocean Road to see the 12 Apostles was very fun. The scenery was beautiful and the Apostles were stunning! Our favorite thing about the tour was Loch Ard Gorge because we were able to go down to the water. The only disappointing thing about the tour was that there was a marathon that was going on, so the driver had to take a detour from the Great Ocean Road, which was still beautiful, just not what we were expecting. The Mantra hotel on Little Bourke St was in a great location and fun to stay at. We were within walking distance of so many things, like the Queen Vic market and all the malls and cafes, so we had a blast! Ayer’s Rock was probably one of our favorite stops. The Outback Pioneer was a great hotel. The food was pretty tasty and the accommodations were really nice all around. Both the sun rise and sunset tours were a lot of fun! The tour guides were really friendly and informative. The sunset tour was our favorite-at first we didn’t think it would happen because it had been cloudy throughout the day, but it took us by surprise and the sunset was absolutely stunning. Port Douglas was a great town to stay in. The Mantra Heritage was a beautiful hotel. We loved our room and the location was perfect. 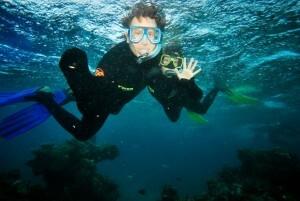 We really enjoyed both the Daintree River tour and snorkeling on the Great Barrier Reef on the Poseidon. For our Great Barrier Reef tour, they gave a lot of information about the reef and also made everyone feel really safe while we were in the water. Our tour on the Daintree River was another favorite. Our guide Bryan was such a great guy and he was so friendly, and offered an immense amount of knowledge about the region, Australia the country, the Daintree rainforest. The Daintree as well as Cape Tribulation & Mossman Gorge were all gorgeous and we saw some crocodiles on the boat river tour which was really cool! Cairns was also very beautiful and we really liked that our hotel was right across from the Esplanade. The Skyrail tour was really cool! It was a bit rainy when we went, but that didn’t affect us too much. Karanda was a cute town; we visited the butterfly sanctuary as well as the Karanda Koala Gardens. The trip down on the train was really relaxing and the landscape was beautiful. Our stay in Brisbane was a lot of fun. There was so much to do around the city! South Bank had so many restaurants, cafes and the museum and theatre were awesome! West End was really trendy and had some cool bars. We even went to a Brisbane Broncos rugby game and saw the Brisbane Lions Aussie Rules football game! 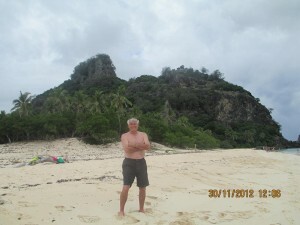 We also visited the Gold Coast and the Sunshine Coast. We definitely liked the Sunshine Coast more than the Gold Coast-it was more relaxed. All in all, we really enjoyed working with About Australia to plan our trip. All the hotels and tours that were booked were accommodating, enjoyable and suited our needs perfectly. We also liked using the vouchers that were provided. When we plan our next trip to Australia, we will definitely use About Australia again! Thanks again About Australia for doing such a wonderful job organizing our trip! I do plan on calling to speak with you directly, but decided to send an email too so you have documentation of how pleased we were with our trip and everything you planned. You clearly understood what our tastes, concerns, and interests were and made the most of them!The trip started out great, all our flights were on time and hassle free. We even made the most out of our long layover in LA by taking a local bus to Santa Monica beach and pier. We had a lovely lunch at a beautiful hotel (Shutters on the Beach) then strolled the pier, and walked all around the area. Then that evening my niece who lives in LA picked us up and we drove to Malibu, saw the sights, and had a great dinner together. Then she drove us to the airport for the long flight to Brisbane which wasn’t too bad as we were quite tired and able to sleep for a decent part of the trip. I think we both enjoyed catching some of the movies, something we rarely do!Brisbane was so beautiful and fun! Of course the reunion with Grace was epic, and we really loved our beautiful hotel and it’s wonderful location. Wasn’t even sure where to begin planning at trip to Australia so of course I searched the web for a travel agent. I found About Australia and read all the great reviews. I called them and they took care of my plans so graciously. I was meeting my husband in Brisbane because he was coming from India after working there, and they coordinated with all of his prearranged flights. I told Rebekah what we liked and were wanting to do (so many choices…can be overwhelming) and she sent me info and answered all my MANY questions. We only had about 10 days to spend there and so we crammed a lot of things into those 10 days. We traveled from Brisbane to Cairns, then to Sydney and finally back home to Texas. 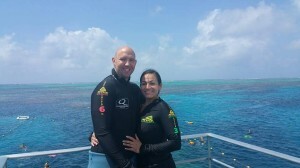 We snorkeled at the reef and saw lots of sea turtles, blue starfish, giant clams and much more. We sand surfed at Tangalooma and fed dolphins. 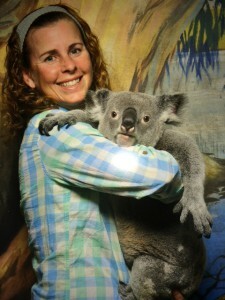 We held koalas, we fed kangaroos and lounged with them too! We jungle surfed (zip line) in the rainforest, we did the canopy walk at Daintree. We stopped to see Malanda Falls and then swam at Josephine Falls…that is a MUST DO! We saw the giant Curtain Fig (must see). We went to 3 different wildlife zoo/sanctuaries and they were all wonderful. We had amazing guides while we were there that were very personable and helpful. They made stops on our excursions that were bonus stops. Go to The Humpy in Tolga if you are out that way…gourmet peanuts, macadamia nuts and other yummy things. That was all in Queensland. 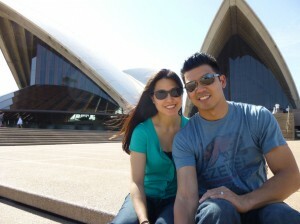 In Sydney, we saw the Opera House and had the 1 hour tour (that building is AMAZING!) It was also the 100th anniversary of ANZAC Day while we were there so that was pretty special. We went to the Blue Mountains and Jenolan Caves and also did a hop on/off harbor boat tour. We had a great trip and couldn’t have done it without Rebekah and the About Australia group. MANY THANKS REBEKAH! Thanks for all your help in making our trip to Australia and New Zealand so easy and enjoyable. We loved the trip and all we saw. With your help we had our own little tour for 4, seeing everything we chose. It all worked with our limited schedule and we feel we saw much of what the two countries had to offer. All we had to do is keep track of our vouchers and be down at the hotel desk on time.Because we were there in the slightly “Off” season there were not large crowds at the attractions. We loved Melbourne with the Colonial Tramcar dinner (so elegant and delicious), the up close and personal connections with the koalas and wallabies at the Moonlit Wildlife Conservation park, and the history and parade of the little penguins on Phillips Island. We loved Sydney also. Our hotel was in the center of Chinatown and it turned out to be the big weekend of the Chinese New Year. Although it was a bit crowded we saw (and got pictures of) a Chinese “Dragon Ceremony” for luck, at the establishment next door to our hotel. That, too, was unique for us. We loved everything, especially the Opera House, and even saw a show while we were there. 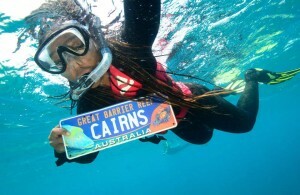 We loved Cairns with the Barrier Reef and the Tjapukai night ceremony and the trip to the Outback. Unique! New Zealand was a real contrast, and had breathtaking beauty. Cooler with gorgeous mountains, lakes and gorges. 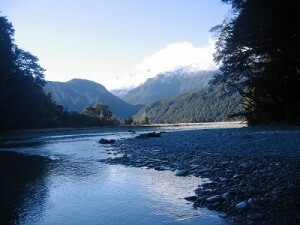 We enjoyed all our tours, especially Milford Sound and the Shotover Jet Boat trip—beautiful! The area around Christchurch is different from Queenstown but equally beautiful We marveled at the stamina and determination of the people of Christchurch as they rebuild after the devastating earthquake a few years ago. All our hotels were wonderful, some new, and some century old government buildings made into luxurious rooms. We found all the people we encountered on this trip to very friendly and inviting. All in All, we can’t thank you and About Australia enough for helping us have the trip of a lifetime! “About Australia” has to be the most wonderful group of people to deal with. From the beginning to end my trip was wonderful! The flight over there was great ( be it a bit long….LOL ) The hotel was superb and very nice people there. From the moment I arrived they were helpful. And it was near Circular Quay which is where the Opera House is and a whole lot more. Walking distance. All the tours that were set up, and what I did on my own was wonderful. Then off to Ayers Rock. This was my bucket list item I have had for a long time. It was just as I thought it would be and more. That whole tour was well done. Then Alice Springs…. a surprise for as it was a lot larger than I expected….but so educational….I loved it. Then off to Brisbane….. and staying with friends. Also great. All I can say is thank you all for you’re planning for me. It will never be forgotten. 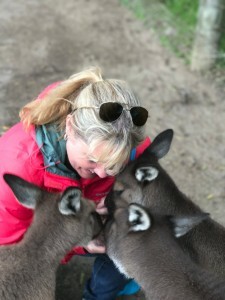 PS I met some wonderful fellow travelers…..
We did a 30 day independent custom tour to Australia and New Zealand and booked through About Australia with Ashley Donaldson. She took care of every detail from flights and hotels to transfers and tours and everything went smoothly! To be traveling 30 days and not have a single glitch is amazing! We have Ashley to thank for that. She was fabulous to deal with. She answered all questions no matter how ridiculous with patience and professionalism. She gave us everything we wanted within our budget. I would highly recommend About Austalia and Ashley to everyone who wants to travel ” Down Under”! We spent Christmas and New Year’s 2014 in Australia. I must admit it was one of my top 5 vacations thus far. And this is coming from someone who has visited more than 50 countries. We were able to visit Melbourne, Cairns, Yulara/Ayres Rock, and lastly we experienced the best New Year’s Eve fireworks show in the world in Sydney! Thank you so much for helping us put together a memorable vacation. We were able to plan our days and activities in each city as we so desired, but working with About Australia to coordinate and organize all of our hotels and airport transfers as well as some specific tours was flawlessly executed! I would definitely not hesitate to utilize About Australia again. We just returned from our Australia vacation, two weeks in Australia two weeks in New Zealand. Joanne with About Australia assisted us in our hotel, airfare and tours while in Australia. I’m very pleased with the choices of our hotels, very centrally located and she pick great tours for us after getting our input. We chose to do independent travel on our tours and loved it. Next time we travel we will certainly call Joanne to assist us again. WOW, what a spectacular trip we had in Australia and New Zealand!!! Our travel agent Melanie Brown in San Antonio was such a pleasure to work with and knowledgeable about what we wanted to do, and not do. She is spectacular, and all of our reservations, accommodations, transfers etc were flawless!!! Sound to good to be true? Well, I speak the truth, she is undoubtably the BEST!!! Our Australian adventures to Melbourne, Kangaroo Island, Adelaide, Port Douglas, Sydney were absolutely wonderful! Each destination had its own beauty, uniqueness, and of course memories. Our accommodations were wonderful and of the 5 star lodging we requested. We were blown away by the our hotel in Sydney, as our view of Circular Quay and of course the Sydney Harbor Bridge were breathtaking and right out our window. 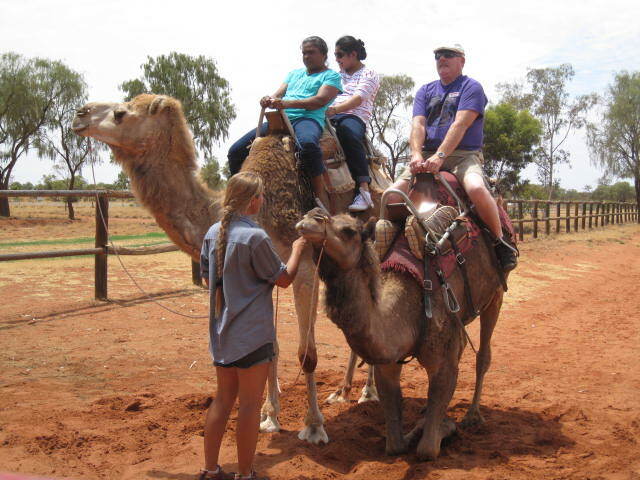 Lisa enjoying her camel ride through the Outback. Megan & Tim, exploring the inner crater of New Zealand’s only active marine volcano, White Island. We had an amazing trip! We spent 5 days in New Zealand, 3 days in Cairns, 2 days on Hamilton Island and 5 days in Sydney and Joanne Palanuik organized the whole adventure to create the perfect vacation! We visited the Hobbiton movie set, the geo-thermal activity ponds and the Waitoma Caves in New Zealand. We went down the Daintree River and through Cape Tributary, went snorkeling in the Great Barrier Reef and saw beautiful beaches in the Whitsundays. We did the Bridge Climb, saw the Opera House and hiked around the gorgeous Blue Mountains. Such beautiful countries and friendly and helpful people all along the way. I would recommend everyone try to travel down under! 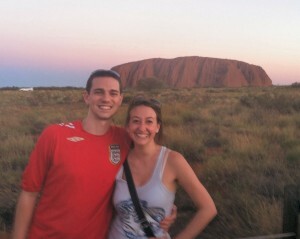 Thank you to Joanne and About Australia for helping us experience the vacation of a lifetime! 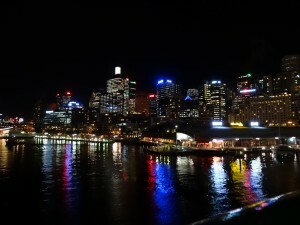 Steve & Melany’s vacation photo of Sydney at night. We had an amazing time, best trip so far in my life. Please feel free to share my email. You did a great job on putting the trip together. I would definitely recommend the agency to my friends and family. Thank you once again. Chuck & Roger’s photo of Uluru after a rare rain storm. Stacy holding a Kangaroo. We’ve never seen a photo like this before! Our adventure around Australia could not have been better. All your planning and arrangements worked out to perfection and ran like clockwork. 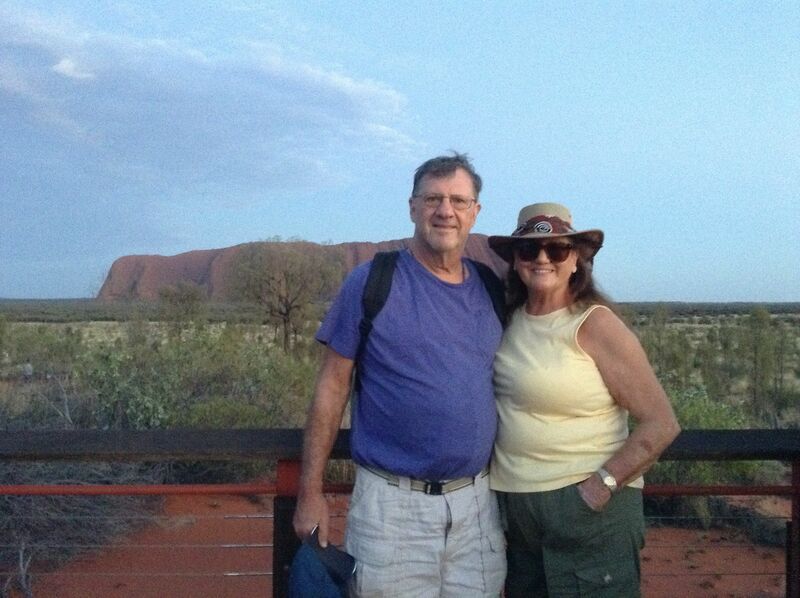 We enjoyed each and every day in Sydney, Alice Springs, Ayers Rock, and Cairns. Each area we visited brought new and exciting experiences. The Cairns diving was an adventure in its self.We met have many people through our travels, but it would take a lot to beat the friendliness of the Australian people. They helped make our entire vacation a wonderful experience.I would like to thank you and About Australia for all the hard work it took in planning each and every detail. If About Australia ever needs a recommendation, don’t hesitate to ask us for one. 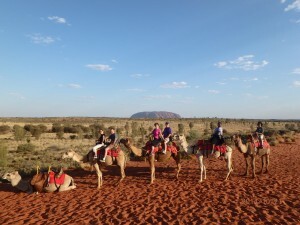 Our experience with About Australia was one of the best we have ever had with a travel agency. Melanie was most helpful and arranged our trip to exceed our satisfaction. Although we hadn’t originally planned to visit New Zealand, her recommendation was much appreciated, for we LOVED everything about New Zealand. All of the cities and tours throughout Australia were absolutely amazing! We would recommend About Australia to anyone and hope everyone gets a chance to visit down under! We had the most incredible trip ever! This pic is I with two Dingos at Australia Zoo. I will book my next trip with you guys! Dingos at Australia Zoo. John H.
Dear AA,I’m writing to let you know that we had a fantastic experience with About Australia! Melanie was fantastic & I would definitely recommend your company and Melanie to anyone who is traveling to NZ or AU. We had a wonderful time in Australia and were pleased with our experience with About Australia. I would be happy to be a referral if needed.Attached is a photo from Sydney. 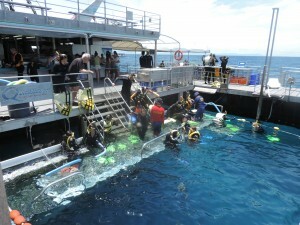 We had a great time diving the Great Barrier Reef, plus the Harbor Bridge Climb was wonderful – loved the view. I’m sorry I haven’t gotten back with you and your associates to THANK YOU so much for the planning and your attention to detail for the Edwards vacation in New Zealand and Australia. It was great; tiring, but wonderful. Carolynn and I appreciate very much your making our life time trip a wonderful memory to last a lifetime. If we can assist with references please don’t hesitate. We are home and had a wonderful trip. Thank you for all your work. I must say that pretty much everything you chose for us was terrific. So, here I’m going to note the minor things that weren’t perfect, just so you know for the future. Please understand, they are minor and overall the trip was A+.In Brisbane, the Coachtrans from the airport kind of stinks. Way too many people and way too many stops for two families traveling with tired children. I would have been glad to have paid more for a more direct and private ride into town. The transportation in Sydney was smaller and more direct, thus great, and Darwin and Pt. Douglas worked out fine. The only disappointment in our touring was the breakneck schedule of our rainforest day. 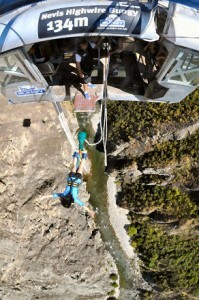 The skyrail up was great. When we got to Karunda, we had almost no time for the butterfly farm and absolutely none for the town. That was a huge bummer, since the town looks so cool. The Rainforest Centre is neat. However, again the pace was breakneck while we were in there and also we got straight off of the bus from there onto the train without any time to explore town again. Personally, I thought the train was overrated, but that’s just me. However, I think if that tour is going to be a day, there needs to be an earlier departure and a later pickup and more free time. Another idea that we had was staying in Karunda or Cairns overnight afterwards, so the airport would be easier to get to. It is not fun getting back to Cairns from Port Douglas. All in all, though, great trip, and we are truly appreciative. We had a G R E A T time on our trip. Kim was wonderful in helping us plan and book our excursions along with answering our endless questions and giving us the details. We didn’t really know where to start and Kim had lots of options for us. The excursions she recommended where just what we wanted to see and the things we wanted to do.Can’t say enough good things. Even the weather was wonderful! We opted to skip Sydney and see the animals and the reef in Cairns and Brisbane. Just not enough time to do it all. We decided to skip the city (what was manmade) and see the animals (that God made).It was a good choice for us. The only disappointment was the Ibis Hotel in Brisbane.The Novotel in Cairns was nice. While the Ibis was in a good location we were disappointed in the hotel. The staff at the Ibis was helpful, pleasant and professional. We had a wonderful trip and wish to thank Frank for making all the arrangements. 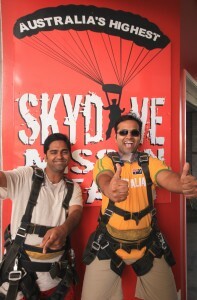 We would certainly recommend About Australia to any of our friends who may have an interest in a trip to Australia/NZ. However, there were two items on our itinerary that were not first rate. The Mercure’s in Wellington and Dunedin were disappointing. In Wellington, the itinerary described the location as being near the Waterfront. Instead, it was a long downhill walk of about a mile. The room was small and not well appointed. In Dunedin, the Mercure, to be honest, is a dump. The room was only large enough to house a queen bed. There was no closet. Although the location is close to the hub of the city, it’s in a decrepit neighborhood. There is a derelict office building across the street and many vacancies along that section of the street on which the hotel is located. The facility was described as being a garden hotel near the university but it wasn’t even close. (I did notice another Mercure over there when we did a tour of the city). I would definitely advise any friends not to accept any stays at any Mercure, except perhaps Rotorua. The Millenium in Christchurch is fabulous.One serendipitous thing happened in Dunedin that more than made up for the disappointing lodging. We noticed in the local paper that Kiri Te Kanawa was giving a one performance concert in the town hall, her first appearance in Dunedin since she won a singing contest that launched her career when she was a teenager, and we were able to get tickets. She appeared only rarely is NZ ever since. The other highlight to the trip was the one hour tour of the Sydney Opera House. Our tour guide was a real pro who knew his stuff and he presented himself and his material better than any tour guide I’ve ever seen and the personal audio system was excellent. I could hear every word he spoke and I’m hard of hearing.